I'm one of those people who sheepishly admits a casual viewing relationship with the behemoth that is 'American Idol.' I'm not a die-hard fan -- far from it, I never vote or buy the albums -- but I do watch occasionally and agree with Simon Cowell almost always. I was pleased that rockin' David Cook won the latest edition over the young, teen pin-up David Archuleta. Cook had substance while Archuleta had a lovely voice and...12 year old girls squealing. And then today happened. I met David Archuleta...by pure fluke. With my friend Anne, we decided to catch a late lunch/early dinner at Fran's diner across from Massey Hall in Toronto. Upon entering, we encountered this good looking guy walking past, very slight in build but very familiar in overall appearance. David Archuleta! Anne was thrilled, I was bemused! David turned out to be shy, a bit awkward, and quite humble when approached by us (well...Anne, mostly) in regard to his wonderful voice and success on 'Idol.' He posed for a photo with Anne (which is now up in its own post) and returned to his gang (most of the 'Idol' top 10, in town for their show at the Air Canada Centre tomorrow). I'm glad you found out for yourself that he is genuinely nice aside from being really good-looking. I'm not 12 years old, far from it but I liked David Archuleta from Day 1. Have a nice day. You mentioned that David is shy and awkward. I think it's one of the things that makes him so endearing. He's so sweet and humble, so grateful for his fans. He's the genuine article and we love him for it. It will almost be a sad thing if he loses his shyness. But he's a good person with a TREMENDOUS talent and I believe he's going to be one of THE great performers of his time. GO DAVID! David is so lovely, isn't he? Good to hear he was just as sweet in person. Thank you for keeping an open mind. 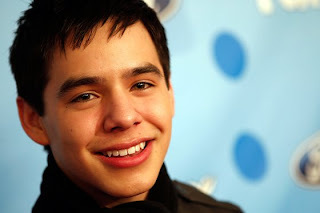 I was crushed when David Archuleta did not win American Idol, but I know now he was have a successful career. You should know also that David is not just loved by the 12 year olds, but also by their moms and dads. Not only is he talented musically, but he is a genuine and grounded in the things that matter. He's infectious. I just returned from the Toronto concert and David shows much appreciation for the Toronto audience and citizens during his amazing 4 song set. I'm sure he was referring to the encounter with you and your friend in that!!! David was lovely...no doubt about it. His shyness does add to his charm and it's easy to see from chatting with him that none of his personality is forced or fake. He's the real deal. I wish him nothing but success -- but with his talent, he won't need my well wishes that's for sure! Thank you so much for your comments about David. I just have this feeling that, although he'll become more self-assured, he's not going to change much despite the huge success that's coming his way. His voice is absolutely sublime, esp. live. But I've met him and he's just the most genuine person ever. I'm not a teen, but am a big fan of David Archuleta's. I've never met him before, but he won me over from his Hollywood auditions. I'm glad you got the chance to meet him and realize what a talented, cool person he is. I hope you make an exception this time and buy his CD. Here we go again, a so called "news media" report that states David Archuleta only has 12 year olds as a fan base. He has more fans that are not tweens and teens. He is a mature, sophisticated music Artist with a huge "adult" fan base. Please, before you post a story, get your facts straight. Just don't assume because he is only 17 that his fans are 12 year olds. This guy is not a Miley or Jonas Brothers. He is a TRUE artist and Prodigy with temendous character and humility. I am an "older" fan and will be a fan of David Archuleta for life. Sorry I had to delete the previous post. I made some big spelling goofs. Anyhoo.. The very most endering thing about David is...ok 2 most endering things is his shyness, and his humble ways. and the thing is he MAY NOT NEED your well wishes, but he lets his fans and every one alike that he APPRECIATES those well wishes. He does this by putting his hand on his heart and then waving to the audience when he sings "When you say you love m" He really loves us and is telling us so. Appreciation is like chocolate, ya just can't get too much of it. From the very beginning David has never changed his character. He is the real deal. What endeared him to me was not just his soulful voice, but the soul that shine from within. I'm not a tween or even in my 20s. I love this kid! I haven't be so smithen by a music artist in such a long time! I love David for waking me up from a somber sleep! Now I just love hearing and seeing his videos from different concert locations. Can't wait for his CD. It's gonna be tremendous!! Hi. David already has a huge following here in the U.S., although I don't know if he realizes it yet. I'm so glad you got to meet him. He's an amazing person and an amazing performer, all in the same body! With such a crazy schedule, he still stays in touch with fans on almost a weekly basis- just incredible! I do hope that you'll consider buying a CD, as his fans want to help him get a great start to his career! Thanks for your honesty and being open-minded. Oh, and it is true that many fans are not teenagers; in fact, a new male fan club has just started also. Have a good day. Hey!Thanks for saying such nice things about David. I'm glad you got a chance to meet him in person. I never watched American Idol except for the first beginning shows when it's just funny...until I heard David Archuleta sing. That was it. I became a die hard fan and remain so to this day. I was lucky enough to meet him briefly in Chicago and he is indeed every bit as sweet, humble and endearing as you described and as he appeared to be on TV. On top of all that he is one of the most amazing vocalists I've ever had the pleasure to hear live. Thanks again for a lovely story! I am so happy you have been able to see in Archuleta what his fans have seen all along. he is a very humble, down to earth, intellegent young man with a great heart. not only is his voice truly amazing that people from ANY age can appreciate but it also have substance and meaning with he sings. he has the ability to evoke deep emotions and connection to the listeners simply by opening himself up in his songs and allowed you to witness a part of him and enjoy it. this young man is well on his way to going places and his adult fans as well as his teens and preteens will support him all the way I am sure. it takes a big person to admit the were wrong about prejudging or misjudging someone without really taking the time out to get to know the truth so thank you for admitting that. I am so happy you were able to meet David. I am happy that he is staying true to himself and sets a great example for everyone. I find him to be a breath of fresh air and consider him a World Idol! David's a great kid in addition to his amazing vocals, not to mention he's adorable. He has no idea how good he is and I'm not annoyed by anything he does, I find everything about him endearing. And there's no typical DA fan. I'm a young 50 who likes all types of music (except country, ugh), but my preference is rock and roll, loud rock and roll. But earlier this year my heart got stolen by a sweet, angelic Mormon boy from Utah and I haven't been the same since. I was lucky enough to meet David a couple weeks ago and found him to be just as kind and caring and humble as I imagined he would be. David is the real deal. That was a wonderful encounter. I believe most things in life do not happen per chance...one more way David's spirit is able to connect with another soul on Earth! His character is as warming as his soulful singing and he spreads that EVERYWHERE he goes!! And this is from a 30-yr old fan, not a 12-yr old! Thanks for saying such lovely things about David. I'm a big fan. I met him very briefly in Salt Lake City and I can agree that there is nothing fake about him at all. He is a genuine person and an outrageously gifted talent. I am really looking forward to watching his career skyrocket. Thanks again!! You're awesome! Thanks for your kind words about David. He has an unassuming quality about him, coupled with a tremendous talent, and a deep spirituality. How can one not be touched upon meeting him. I saw him in LA at the Staples Center and can't wait for his solo concerts and his upcoming cd. I'm not a teen either, but I am a lover of his gift and artistry. Thanks again for your observations about David! I'll definitely be on the look out for his album. One talented kid. Thanks to everyone for visiting and leaving comments - you've all made my day! Please feel free to stop by anytime! I'm glad you recognized what David's fans have known for a while and actually took the time to write about it: David’s sweet, an amazing talent, humble and real. I am black woman in her early thirties who thinks David is terrific not the 12 year old stereotype that detractors tried to paint all David’s fans as. This is the first year I am going to the AI concert and I only going because of David and my husband and I plan to carry sign to that effect. Thanks for sharing your experience. I, too, am far from being 12 years old BUT adore David Archuleta. Not only because of his vocal abilities but because of his unassuming nature. To me he is a breath of fresh air for the music industry!!! I always like to read other's reviews and comments. It was nice of you to write what you did about David A. especially since David C. was the one you had your eye on during the American Idol season. From all that I've read. . . David A. LOVED Toronto. Thanks for being so gracious. ..Was so glad to hear that you had a chance to meet David Archuleta and came away with a new perspective of him...I am one of his biggest supporters and I am so far from 12, it's depressing! Nevertheless, his appeal is wide spread among people of all ages and I know this from my interaction with the FanBlast community...great group of people who love & support David. Thanks for your open-minded comments of David. We'll be hearing from him for years to come! Oh my gosh! I'm sitting here getting all teary-eyed as I read your blog and the subsequent comments. It just feels so weird being a fangirl for the first time at the age of fifty-three. So when I read that others have been as touched by David as I have been (some pretty near my age), I start to feel a little normal again. Okay, I take that back; this will probably soon be my new normal. And that's good. Lost That Girl, thank you so much for taking the time to let readers know that David is the humble, genuine young man we came to love during AI Season 7. He is an amazing talent and, because of those very qualities, he reached down and touched my soul with his singing. He said how nice the people are there and you were one that probably influenced that comment. Thanks for being so nice. His voice gives me chills and I love that he doesn't really know how good he is. He believes music can make the world a better place and can touch peoples lives. I hope he always believes. He is a gift. I am definitely not a teen, more like 49, and have been a huge fan of David A. since his audition on AI this season. I went to the Toronto and Rochester concerts just to see HIM and hear THE VOICE live. It was worth every penny and then some! I got the opportunity to meet him and tell him how special he is and how much his music means to me. Thanks for your post. Thank you so much for being open-minded and recognizing your error in regards to David. He is truly a wonderful, kind, loving human being besides being an off-the-charts, incredibly talented young guy. Just so you know, let me give you the results of a poll that gave information about David's fans. Fans are 70% female, 30% male. Age wise, they are 30% ages 17 and under, 28% are 18-30 years of age, and 42% are 30+. Clearly, David appeals to people of all ages and both sexes. I have never, EVER been a fan of anyone but am over the moon for David Archuleta. He is an amazing talent. I am convinced that he will be the voice of his generation. In five years, he'll be as big a household name as Celine Dion. Watch and see. With the unbelievable talent that he has, the rare musicality and ability to connect with his music and his audience, that endearing personality and way cute face, he is destined for superstardom.